When did the first people come to China? Early people made it to China about 700,000 years ago. They were Homo Erectus, and maybe some Denisovans. One example is “Peking Man”.They had dark skin and wide flat noses. These people lived in caves. They made fires and used stone tools. The first modern people seem to have reached China much later, about 50,000 BC. They probably came from two directions. Some of them came to North China across Central Asia. Others came to South China up the Pacific coast from Southeast Asia. They arrived about the same time that the first people moved into Europe. At first, they shared space with the Denisovans, but the Denisovans died out in the last Ice Age. These Chinese people also lived in caves, made fires, and used stone and bone tools. But during the Ice Age they started to wear fur and leather clothes. They were hunters and gatherers. Probably they also spent a lot of time fishing, like other Pacific Rim people in Japan and Ecuador about the same time. Chinese people started to make pottery about 14,000 BC, about the same time as these other fishing people. Probably they used pottery jars to ferment the fish into pickled fish or fish sauce, that would keep longer. When did people in China start farming? Another big change happened around 8000 BC, in the Neolithic or New Stone Age. People started to farm rice and millet as their main foods. Another big change happened around 6000 BC when people in China started to keep animals (like sheep and chickens). West Asian people had already been farming for about three thousand years, but we don’t know whether people in China learned how to farm from the West Asians or began doing it on their own. Probably they began on their own, maybe because of climate changes. As in Egypt, India, Peru, and West Asia, the first place where people began settling down in cities and using irrigation was in a river valley. 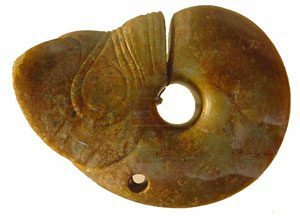 It was along the Yellow River in northern China, about 3000 BC. Once people living in China began farming, they also began to live in villages and build small houses with reed roofs. We know about two kinds of Chinese pottery from this time: red clay pots with swirling black designs from north-west China, and smooth black pots from north-east China. About this time people in China also began to use silk and hemp to make clothes, and to use wagons with wheels. Probably, like the Sumerians, they learned about carts with wheels from people in Central Asia who had been using wheeled carts since about 3700 BC. How do you make silk? Cite this page: Carr, K.E. Stone Age China – Early Chinese History. Quatr.us Study Guides, June 6, 2017. Web. April 21, 2019.